SCAA's Safety Committee launched their 2016 education program, which focuses on Expectation Bias. This is a safety hazard that transcends all aviation disciplines and basically describes the situation where an individual sees and hears what they expect to...rather than what is actually happening. This safety hazard creates scenarios of reduced situational awareness and complacency, ultimately leading to errors causing conditions. Each of the three SHARE events this year will focus in part on this topic, leading up to our annual Safety Standdown Day in September. Our keynote speaker for this year's Standdown Day is Dr. Tony Cortes of Embry-Riddle Aeronautical University. Dr. Cortes, a former Air Force pilot, has done extensive research in the field of expectation bias and human factors. He has a gifted delivery that portrays the issues of expectation bias into practical terms. Dr. Cortes, along with three other speakers will offer participants great insight and tools into avoiding these issues. For more information on this year's SCAA safety programs, please see our website at www.socalaviation.com/safety. The SCAA began the Safety Hazard Awareness Reporting and Empowerment (SHARE) program in 2013 in an effort to establish a collaborative reporting system for SoCal aviation operators - that includes Part 91 and 135 operators, as well as FBO's, maintenance repair stations, ATC, flight schools, and anyone else with a stake in aviation safety. The SCAA Safety Committee encourages SHARE participants to routinely log in and enter safety reports into the SHARE website. The more participation we receive, the more data we will collect for analysis, and the more useful SHARE becomes to all involved. Please login, enter reports when appropriate, and contribute to existing reports by leaving your anonymous comments. We will continue to reach out to existing SHARE participants as well as potential new contributors in the SCAA to bolster our data set. We received 33 safety reports in 2014, and hope to increase that number dramatically in 2015. By collecting more data, we will be able to use reports of hazards and safety occurrences that affect our members to drive the discussions at SHARE events. If you are not a registered participant please contact safety@socalaviation.org<mailto:safety@socalaviation.org> for more information about becoming a registered member. The Safety Committee will hold five SHARE events in 2015. Four of these will be small two-hour roundtable discussions focusing on FBO and Maintenance safety. One roundtable for each topic will be held in the L.A. and San Diego areas. Stay tuned for dates and times. We will also hold a main SHARE event on the afternoon of the SCAA annual membership meeting on June 2015. With IBAC unveiling IS-BAH (International Standard for Business Aircraft Handling) in 2014, we will strive to be more inclusive of FBOs and maintenance organizations in our safety programs at SCAA. We hope to stay at the forefront of collaborative safety data sharing and to set the example of what is possible on a regional level. The ultimate goal for our members is simple - as a group, we only need to learn a safety lesson once! The Flight Safety Foundation (FSF) last week released a new guide to help pilots monitor their flight paths more carefully. The Practical Guide for Improving Flight Path Monitoring<http://www.cfmediaview.com/lp1.aspx?v=8_87397011_3208_10>, published on November 13, is based on the work of FSF’s Active Pilot Monitoring Working Group, which looked closely at aircraft accidents with causes related to ineffective monitoring of an aircraft’s flight path. The group’s nearly three-year effort identified a number of barriers to effective monitoring: human factors limitations, time pressures, lack of feedback to pilots when monitoring lapses occur, the design of flight deck systems, standard operating procedures, pilots’ inadequate mental models of autoflight system modes and corporate cultures that do not support an emphasis on monitoring. The group developed 20 recommendations organized into four categories: practices, procedures and policies; autoflight systems; training; and evaluating monitoring skills. One of the key recommendations was the need to clearly define the role of the pilot monitoring. Another is the need to create and practice intervention strategies that maintain effective monitoring or–in the event the monitoring pilot becomes distracted–return his attention to the job at hand. The guide offers an illustrative PowerPoint training aid (linked online through Appendix B). Greetings from the SHARE Portal Gatekeeper! SCAA is excited about our new web portal and the safety information we are collecting. Much thanks to those that have submitted safety reports. Please keep it up! For those registered SHARE participants that haven¹t, please start entering safety reports into the system soon. The more reports we get, the more valuable the tool becomes for everyone. One note on safety reports, please keep in mind that the quality of the report is very important. Please give as much information as possible. If there are changes after submitting the report, such as investigative results or a resultant policy change, let me know and I will add this information to the report. The two charts were captured from the SHARE Portal showing the types of reports that we are getting. Please take a look and see if your safety programs are showing similar trends. 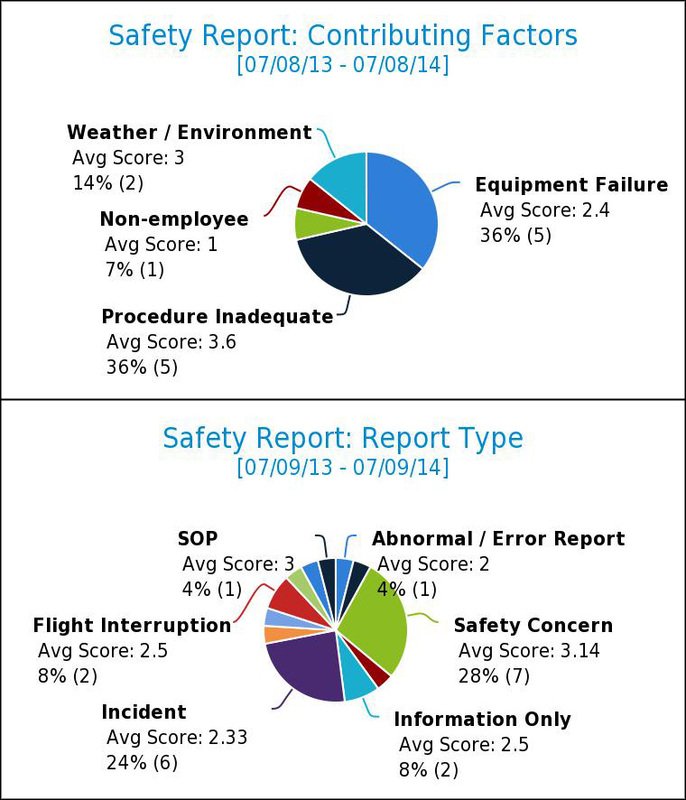 Note that almost all of our safety reports are submitted by pilots. We encourage you to motivate your maintenance, contractor, and administrative support personnel to submit reports as well. Pilots that submit reports on behalf of maintenance or other personnel should indicate in the "Submitted By" field who they are reporting the information for. As always thanks for your support and if you have any questions please contact me at safety@socalaviation.org, ordan@helioniss.com. The Safety Committee hosted the third SHARE Roundtable event on June 23rd at Premier Jet (CRQ). This roundtable event focused on air traffic control (ATC) related issues that can compromise the safety of flight operations. In addition to three (3) SoCal TRACON air traffic controllers there were more than thirty (30) people in attendance. Ken Mazzola, Safety Officer from MedImpact and member of SCAA’s Safety Committee moderated the roundtable event. Climb Via SID/Descend Via STAR – Important requirements for compliance with these new communication requirements. The next SHARE Roundtable event will be held in November and will focus on facility and maintenance related issues. If you are not a registered SHARE participant, we encourage you to visit SCAA’s Safety SHARE webpage to register. If you are already registered, please submit your maintenance and/or facility related safety reports on the SHARE portal. Our goal is to develop our roundtable topics from data collected on the SHARE portal. This will insure that we are bringing current, relevant topics to SCAA’s membership while helping everyone learn important lessons from the experience of fellow operators, FBOs, maintenance facilities, and other aviation professionals and vendors.